Archery is the 4th sport in the Bible that I featured in my devotional series at AWANA. Let me begin by saying that, to my surprise, archery (in a way) is the most talked about sport in the bible. How, you ask? Well, there are actual archers in the Bible in some of the war stories (King Saul met his demise to an arrow 1 Samuel 31). Ishmael, Abraham’s son with Hagar, was an archer (Genesis 21.20). Esau hunted with a bow and arrow – (Genesis 27). 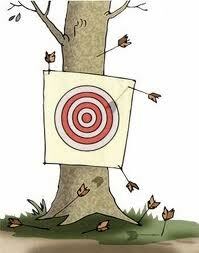 And perhaps the most well known story involves arrows that are purposely off target. Jonathan used an arrow to send a message to David, who was in hiding. (1 Samuel 20). In all, there are over 50 references to archery, bows or arrows in the bible. But even more than that – one interpretation of both the Hebrew and Greek words for “sin” is “to miss the mark” – to be off target – an archery term. Imagine, if you will that a king is preparing to go to war. He calls all the archers in front of him, wanting the best to take on that role in defense of the kingdom. They have 1 shot to hit the target. If they miss, they are dismissed – there are no second chances. That is true with us, too. Once we miss the mark (sin) there are no second chances for us, we have blown it. We fall short of God’s standard of perfection. We are unable to keep from missing the mark. But, thankfully, God didn’t want to leave us without hope, so He sent Jesus to take the penalty for us, He provided the chances that we need but could never get on our own. Let’s be thankful and amazed that God can forgive our sins, not just once, but every time that we miss the mark, and let’s gladly embrace the gift of grace that He offers, and tell others that we meet about the Amazing Grace that he offers to all.